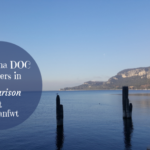 While chatting it hit me, they are producing sparkling wines or rather artisanal prosecco, and I still need to choose a wine to write about for the #ItalianFWT group this month. Could I be so daring as to ask for a bottle…? Well, I did and Paola said yes. She was so very nice that she carried the prosecco bottle around all morning the following day until we met around lunch time. We met in the networking hall at the Wine2Wine event and she gave me the bottle. Of course, with the bottle in hand, I asked her if she would agree to do a short video together so she could tell us about their winery and winemaking in a few words herself. The theme this month will be Exploring Italian Sparkling Wines #ItalianFWT. As I mentioned above I was not sure what sparkling wine to choose for this month’s theme as there are so many I like. 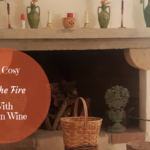 In the end, the choice became clear in a very spontaneous way, and I chose to write about the Asolo Prosecco Extra Dry sparkling wine of Bele Casel winery in Veneto. On Saturday, December 1, you can join us on Twitter at 11amEDT / 17.00 CEST to learn more about food and wine, as well as travel experiences regarding Italian sparkling wines. Just type in the hashtag #ItalianFWT in the search field and click Enter, thereafter, you click Latest which will show you all the live tweets. Bele Casel is located within the area of the Asolo Montello denomination in Veneto. Let us start to look a bit closer at this production area which is different from the Conegliano Valdobbiadene denomination. The Asolo hills in Veneto are located just by Mount Grappa in the province of Treviso. This is an area in the middle of the Prosecco district in Veneto, close to the area of Conegliano Valdobbiadene Superiore DOCG. This is a viticultural area with a long history and winemaking tradition dating to the era of the Roman Empire and perhaps further beyond. I was later on during the Middle Ages that this area would become even more important for wine production. It is said that it was the local monasteries with mainly Benedictine monks that developed the art of vine growing and winemaking turning into centres for agricultural studies and techniques. 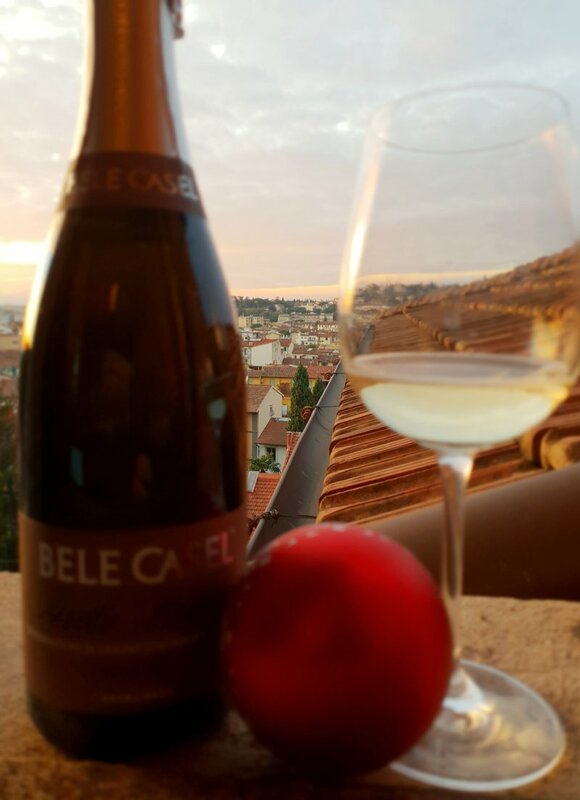 Let us now focus more on Bele Casel and their winemaking story. When you read their story on their website you really feel that they are a family winery, or rather an artisanal prosecco producer. The father of Paola and Luca started out small with his father-in-law and step by step they began to produce prosecco wine in the evenings after their daytime jobs. 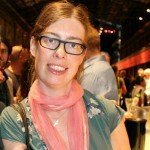 What started out as a sidekick and a passion has then developed from a ‘garage’ activity to a professional winemaking business. The turn would be about five years ago when they were chosen by an American importer among several other larger prosecco producers for their distinctive quality. This was in a period when they, as they describe, still seemed to be bottling and putting the labels on their ready bottles by hand. The craftsmanship and their passion for what they do shine through both when looking at their website and when I met with Paola. 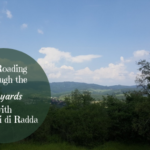 Paola told me that they are now producing around 150 000 bottles a year which in other areas or regions would already be considered as a mid-sized winery but in the prosecco district where most wineries are producing millions of bottles, they are still seen as small. They are indeed focused on quality and to produce prosecco wines that are an expression of the terroir in the Asolo Montello area. For those of you who have tasted their Asolo Prosecco Colfondo or this Asolo Prosecco Extra Dry, I am sure you can agree that there is no doubt that these are top notch prosecco wines. 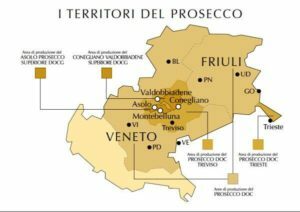 And once you have tasted Prosecco wines like these, there is no going back…After these wines, you will just find it very hard to drink a mainstream and more industrially produced Prosecco. What about the grapes used to produce Asolo Montello prosecco wines then? Well, as you might already know Glera is the main grape variety used. Glera is a grape that originates from the Carso Triestino area in Friuli Venezia Giulia and was then brought to the Treviso area in Veneto, while others say the opposite that the Glera grape has its origin on the Colli Euganei in Veneto. If we set aside the birthplace debate, this grape variety has an interesting history. It is considered to have been a very highly esteemed and liked grape during the Roman Empire era. The first written records of the word Prosecco (which used to be the name of the Glera grape until recently) dates to the mid-18th century. In that period, it was not widely grown in the area because of its sensitivity to vine diseases. This is a Prosecco made with 90% Glera as we mentioned above and the other 10% are a mix of Perera, Bianchetta Trevigiana, Marzemina bianca, and Rabiosa (the last two I am not sure if I heard correctly, I still need to research them). 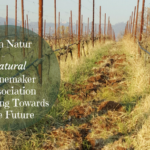 The Glera comes from two single vineyards and the other grapes are local native grapes that are very dear to Bele Casel and they try to revitalize them. I wanted to share this bottle with friends but as I just got back from Veneto the other day, I just opened it on my own today. As I wrote before, I have already tasted their Asolo Prosecco Colfondo several times and I am really hooked on that one. This Extra Dry is for sure one of my favourites now too. It is a very mineral and savoury sparkling wine with a nice persistent perlage. It has lovely notes that are a mix of citrus fruits, white fruit and white flowers. In the beginning, I also felt a bit of a green or herby touch underneath. 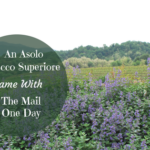 This Asolo Prosecco Extra Dry DOCG Superiore from Bele Casel is a wine that surely will go well at your Christmas table either as an aperitivo or for dessert with the typical Christmas cakes and goodies. Some parts of the history of Asolo Montello has been taken from an older article of mine about Asolo Prosecco wines. Sounds like a wonderful producer Katarina. Wish I could get my hands on some of their Col Fondo. It’s style I really enjoy! Thank you Martin 🙂 yes it is a producer that make fantastic prosecco wines. I think Paola replied in a tweet where they are in the US. Hope you can find them. 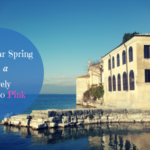 What a nice story of the winery, there is so much more to know about Prosecco ! What a great twist of fate to meet Paola just as you were writing about Italian sparkling wine! I don’t think I’ve ever had one from Asolo, and I’m intrigued by the blend of indigenous grapes used to make this one. You always give us something new to learn and taste so thanks for introducing us to this wine! Thanks Lauren, happy you liked the article. Generally, Prosecco is always a blend with a tiny part of local varieties that they don’t mention much though. And, I think very few are 100% Glera but I could be wrong of course. What a fortuitous meeting! I will definitely be on the lookout for the Col Fondo! Thanks for the background on the grapes, particularly those beyond Glera as one finds very little about these. Thanks for your comment Nicole, nice that you enjoyed reading about the grapes. 🙂 True, usually people focus only on the Glera. Interesting beginning for them. Don’t we all get sucked into the wine world ; ) Glad you grabbed that video as well. It’s always nice to be able to meet the families. Thanks Jen, yeah it was fun to do the video together with Paola.